This Newport 460A-Z High-Performance Integrated Ball Bearing Linear Stage is the Z-axis for the 460A Series of linear Stages and bolts directly onto the top of either the Newport 460A-X or Newport 460A-XY stages. Its ball bearing movement offers smooth movement at a affordable cost. 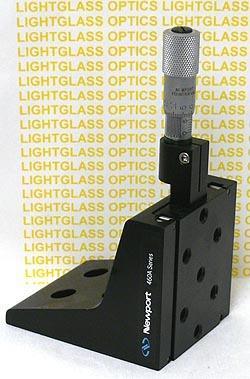 The Newport SM-13 micrometer actuator shown in the photo is included in the price, and offers .500" of travel. The front face of the stage is drilled and tapped to accept 1/4-20 fasteners, and the counterbored mounting holes are on one-inch centers so this could be mounted directly onto a breadboard or optical table.